You've seen it in TV shows for many years, advertised in commercials in the last few years, you've done it on your laptop, and now it is time to make a video call to a loved one from your Android device. Obviously, the first thing you will need is an Android phone or tablet that has a front facing camera along with microphone and speakers. Since this covers most devices in the last couple years, this should be most of you. If you are one of the few that does not have this hardware, like many with older Android phones, let me know in the comments below and I'll try to help you with a workaround. What video service/app works on my device. What video service/app is being used by the ones I wish to communicate with. 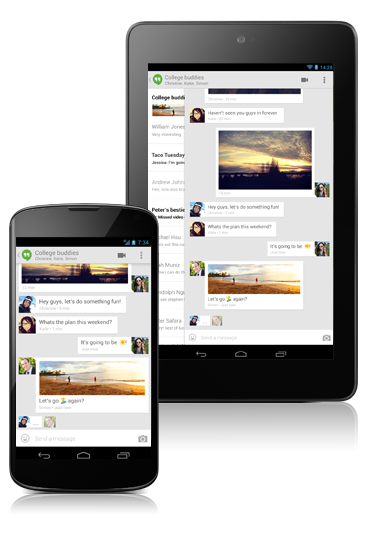 Once installed from the Play Store, you will find that Hangouts is a very powerful conversations tool. Try not to think of Hangouts as a simple in-and-out tool, instead keep the conversation going for as long as you need. In terms of family and friends, you'll likely keep the conversation open indefinitely. You will need to know the Google+ name or email address of persons you wish to chat with to get started. Just hit the "+" symbol to add a new conversation and choose the person(s) you wish to include. Text chat is the main tool here, but it is easy enough to plunk in a picture and, back to the point, one click of the Video camera button in the top right and you start a video call, it's just that easy. Inside the call, you have a few options, muting your microphone or camera for starters, adding others to the chat/call and more. Of course, muting the camera on both ends turns this into a free 'phone' call, nice! If you've previously used Hangouts on your computer, you may be sad to learn that many cool features, like the clown mask and kitten ears, are not available on Android; life is just simpler that way. Now, you will see a full screen view of the other person in the call and a thumbnail view of yourself. With multiple persons on the call, you will see thumbnails for all and a full screen view of the person that is talking, (or is the loudest...) click on any of the thumbnails to override the auto video switching and bring that person to the front for your screen. Skype includes a great number more settings and setup procedures. They are easy enough to get through, so I'll leave you to follow the on-screen directions. Inside, the same basic procedure is in place, you must know the Skype name of the person you wish to communicate with to get started and when you connect with them you will be able to text chat, send pictures and initiate a video call all with a few clicks. Skype has another layer of functionality as a telephone service. Skype-to-Skype calls are free, then, for a very reasonable fee, you can use Skype to make calls to almost any normal phone in the world. Solidly mount your device, when possible. It is really hard for people to watch a bouncy video, some even experience vertigo and/or become nauseated. Please find a way to solidly mount your device so that it is stationary for your call. Feel free to move yourself, this is fine, but a moving background with a stationary foreground can be tough for some people. Use a headset, when possible. Audio feedback and looping, or echos, are very common when using these video chat tools. What happens is that your microphone picks up the sound coming out of your speakers, which would be the other person talking to you, sending it back to them, creating a loop. This sounds like an echo, unless it is fast enough that your audio input and output happen at the same time, then you get the wonderful screeching sound of feedback. It takes a lot of computing power to be able to strip out the looping sounds, often adversely stripping out your voice in the process so that you cannot be heard. The easiest fix is to make sure that your microphone does not pick up your audio output, and the easiest way to do that is to use a headset or earbuds. As you can see in the images below, somewhere between 200,000,000 and 1 billion users have downloaded and installed these two apps, go ahead and click one, or both, to be user 1000000001.